Weighing The Week Ahead: Time To Raise Price Targets? Is it time to raise price targets? Last week featured earnings news and generally positive economic data. I always start my personal review of the week by looking at a chart of market price moves. The key feature is the lack of volatility. Prices moved only about 0.6% from top to bottom. As I indicated recently I am moving the Silver Bullet award to a standalone feature, rather than an item in WTWA. Last week’s deserving winner was Ben Carlson (his second award). We also posted the list of all past winners. I have a great candidate for the coming week as well. I hope that readers and past winners will help me in giving special recognition to those who help to keep data honest. As always, nominations are welcome! The economic news last week was generally positive. ISM manufacturing improved and beat expectations, registering 56.3. Here is Scott Grannis’s chart of this index versus the economy. He calls it one of his enduring favorites. 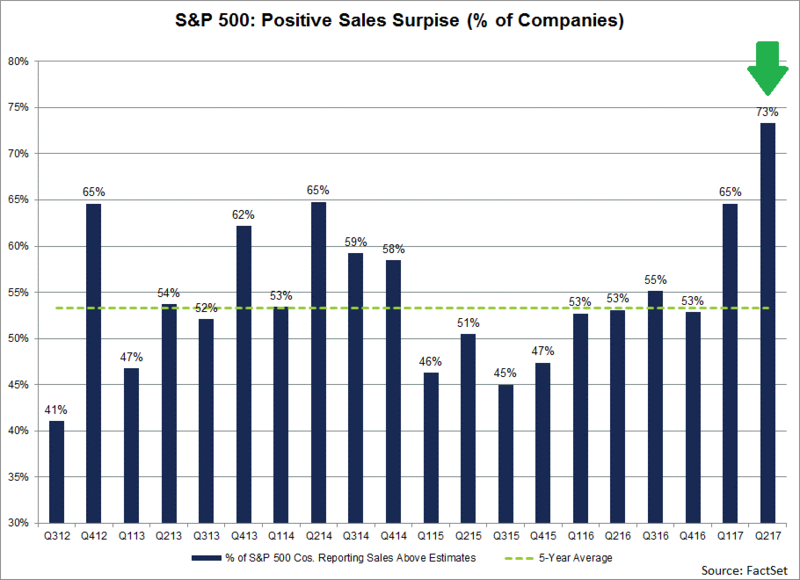 Factset notes that a record percentage of companies are beating expectations on both earnings and sales. John also notes that references to the Trump Administration effect on earnings have declined dramatically. (Contra – Avondale’s conference call monitoring notes some weakness). The “forward 4-quarter EPS” has still not cracked 10% y/y growth, and it may not, since the earnings compare’s get tougher with the 3rd and 4th quarters since crude oil prices were less of a drag in the back half of 2016, but you also have Financial’s possibly to starting to enter a period where revenue and EPS growth could accelerate. The forward estimate trends remain positive. For SP 500, it’s one of the best leading indicators we have. GDP estimates are higher. The Atlanta Fed’s GDP now forecast is showing strength. Will it hold up this quarter? Long-leading indicators remain positive. New Deal Democrat has plenty of important data you probably do not see elsewhere. ADP rose to 178K, slightly beating expectations for private employment. This is a good independent measure of private employment changes. Initial jobless claims declined slightly to 240K. Jill Mislinski and Doug Short illustrate how dramatic this level really is. Payroll employment showed a solid (if unspectacular) gain. More of the unemployed are longer term. Bob Dieli is an expert tracker of all things employment. He is concerned about the early shift in this ratio, and is monitoring the change. Construction spending declined 1.3% versus expectations of a gain of 0.5%. Rail Traffic was slightly lower ( Calculated Risk ). Contrary interpretation of the data from GEI. 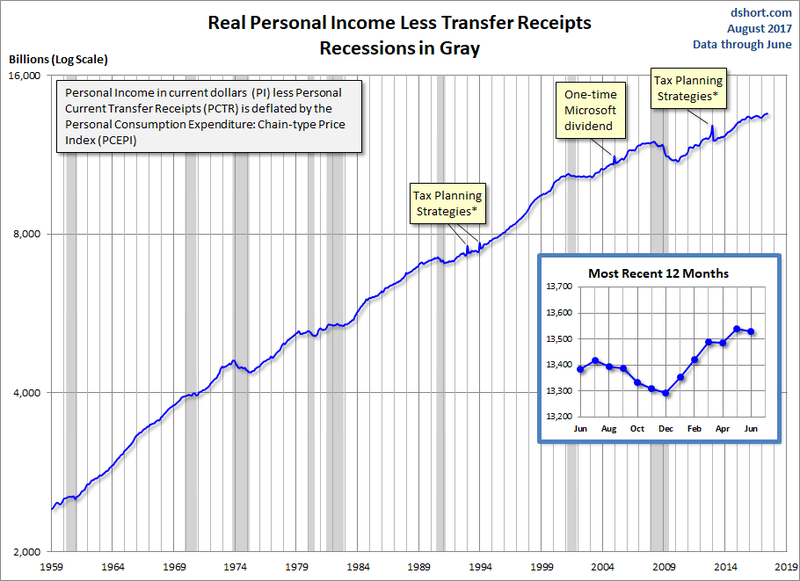 Personal income showed no growth versus an expected gain of 0.3%. Jill Mislinski and Doug Short make the adjustments for inflation and transfer payments. The result is a bit less distressing. Auto sales missed expectations for nearly all companies. The aggregate pace is now below 17 million vehicles per year. Bloomberg explains that cars are lasting longer. Fair enough, but still not good for the economy. I am disturbed by the Pew survey report (Via Statista and GEI ) that most Republicans (58%) see colleges and universities has having a negative effect on “the way things are going in the country.” I confess my bias from many years of experience, but that experience also confers knowledge. It was also an ugly month for CNBC , where ratings continue to decline. It was their worst month in 22 years, with Fox Business taking the lead. It is a light economic calendar. Inflation data are still not very interesting. JOLTS provides information about labor market structure, but few use it for that purpose. There is not much FedSpeak. With President Trump joining Congress on vacation, one source of news (and volatility) might be absent. The light calendar leaves plenty of news time to fill. Expect the punditry to fill it, whether there is news or not! Is it time to raise our price targets? Everything is over-priced. My price targets will eventually be proven right. I want to stay on the company’s good side. Access is essential. I’ll keep my “buy” rating and raise the target. The market might be OK for a bit longer, but the twelve-year outlook is poor. Everything looks really good – just like we see before a big decline. The rally is based upon dumb money, the Fed, Trump, blind ETF investing. Stocks are due for a big correction. Targets should change with the fundamentals – especially earnings expectations. We monitor the stocks in our portfolio as well as those on our watch lists. We review price targets frequently. We sell when a stock reaches or approaches our target. Apple is a good example. We sold it after holding it for many profitable years, including times when many analysts hated the company and said the low multiple was deserved. What has changed? Adding debt, much higher enterprise value multiples, and the analyst lovefest are factors. You must choose companies and hold on when others are skeptical. Be willing to sell when they join in. Apple is still a great company with wonderful products, but it is much more expensive. As usual, I’ll have more in my Final Thought. 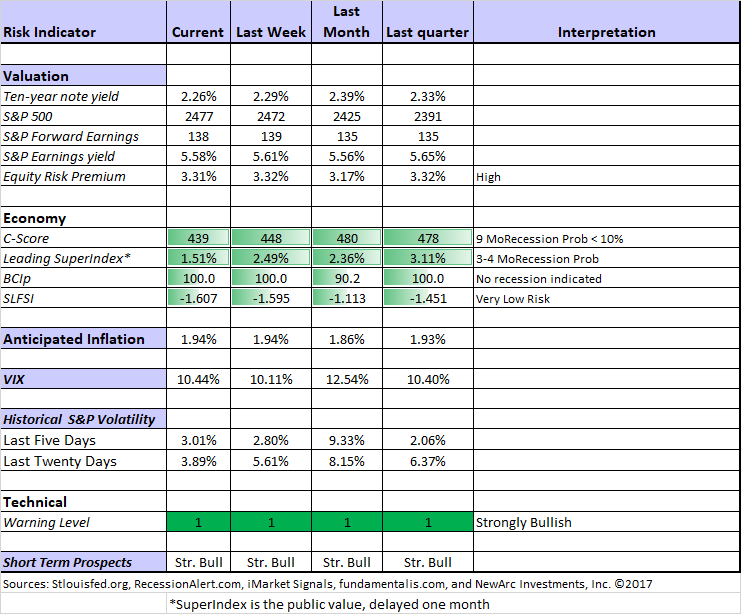 Doug Short : Regular updating of an array of indicators. Great charts and analysis. 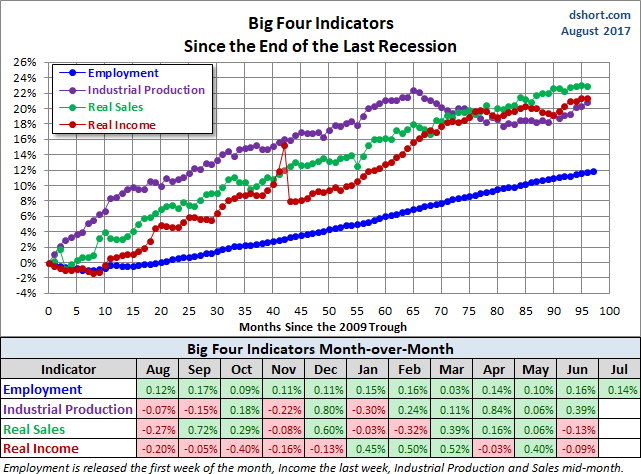 Here is an update of the “Big Four” economic indicators highlighted by the NBER. If I had to pick a single most important source for investors to read this week it would be this wonderful article from Morgan Housel , describing what you would hear in an honest business news report. Here is an excerpt for the flavor, but you will enjoy the entire post. Three dozen political pundits yelled at each other on TV in front of an audience of 75 million. Meanwhile, a couple hundred million people were reasonable and productive in front of an audience of zero. Facebook stock fell $0.23 to close at $169.16. Four-hundred seventy one news outlets covered the move. No one knows why. Analysts expect more of the same tomorrow, with the trend continuing into next week. “But Morgan said it better,” I replied. Despite the new market records, there are plenty of ideas. Barron’s (subscription required) is still on the case with some oil service stocks. Peter F. Way looks at Chevron versus Exxon Mobil, using his unique Market-maker pricing. The result? Meh. Check out the full post for some great charts and analysis. He also compares defense stocks Lockheed and Raytheon. Check out his verdict, and take him up on his offer to reply to your questions. Blue Harbinger’s screens have turned up five attractive stocks that will trip the trigger for many investors —- high yield and also contrarian. Check out the post for plenty of charts and detail. Simply Safe Dividends highlights a less-famous dividend growth legend, V.F. Corp. ( VFC ). Fans of his approach should also check out Cincinnati Financial ( CINF ). I strongly recommend that investors read a variety of sources. This means a focus on those using objective data! The fear of new highs that has been explained here in previous missives played out this week with the latest report from AAII . The Dow 30 just crossed another 1,000 point threshold, most major U.S. equity averages are at or near all time highs, and bearish sentiment spiked from 24.3% up to 32.1%. That’s the highest weekly reading since mid May, and the largest weekly increase since March. Bullish sentiment stands at 36%, that makes 135 consecutive weeks below 50%. Scott Grannis has one of his typical chart packs, describing the no boom, no bust economy. The 1000-point thresholds are falling rapidly ( Bespoke ). When I was on CNBC for my early Dow 20K forecast they asked for my current opinion. I said that the next 8-10% would be pretty easy. We are there. More on my take in the Final Thoughts. Bespoke points out that retracements to prior levels have become less frequent, despite the narrower percentage. Seeking Alpha Senior Editor Gil Weinreich has an interesting topic every day. This week I especially enjoyed his commentary on cuts in employer retirement support. As he frequently does, Gil raises a topic of importance both to advisors and to individual investors. I read it daily, and you will enjoy it as well. Risk. Before even considering price targets, there is an important first step: Risk Assessment. Risks should be tangible and measurable – not a fuzzy prediction of danger or disaster. 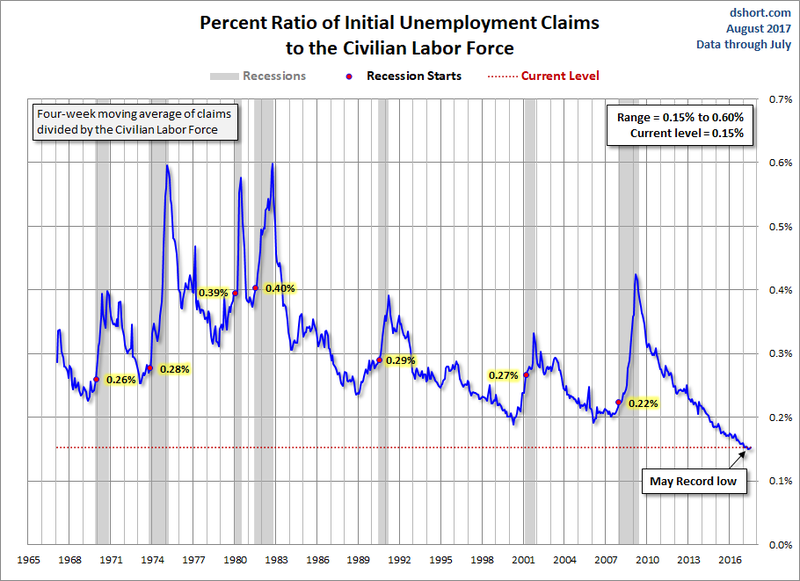 The most important risk is usually a peak and decline in the business cycle (the technical definition of a recession). I watch this closely, and so should you. Risks are present in both directions. Upside risk happens when you exit a market which proceeds to rally without you. Most people find the re-entry psychology to be impossible. Reward. Changing your price target just because the old one was hit makes no sense. Targets should relate to the fundamental prospects for the stock, bond, or market. Here is a simple method. Compare this return to the expected rate of inflation. Most people would love to see a 5% CD rate, but no so much if inflation were 8%. Compare the return to other investments of similar risk. Consider events which could add to profits or reduce inflation. The simple process is of comparing risk and reward is the foundation for asset allocation. The information needed is available each week in the quant section. If you are “scared witless” (TM euphemism OldProf) by the doom and gloom stories, you are not alone. Jason Zweig reports that in the past month individual investors pulled $17 billion from stock funds and invested $29 billion in bond funds. [Some readers might enjoy my recent short paper, Getting Back in the Market . This has more specific suggestions about attractive stock sectors and good tactics. The Top Twelve Investor Pitfalls will help with your plan. Understanding Risk might also be of interest. All are free at your request from info at newarc dot com]. The upcoming debt limit issue. No signs of progress so far. Incipient trade wars. Whether it is Canadian lumber or U.S. potatoes to Mexico, there are consequences to reducing trade with our key partners. The Fed. That includes both rate increases at a reasonable pace and the planned balance sheet reduction. Alleged complacency among stock investors. Low volatility represents equally balanced opinions with a lack of dramatic, fresh information.